And I thought the fire breathing babybot would be the last time I saw a ginormous baby robot. 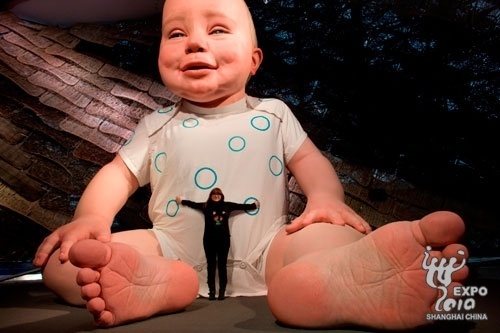 Isabel Coixet, the Spanish director who both wrote and directed Bastille (one of the 20 segments from the wonderful film collage, Paris, je’taime) has created an enormous and strangely realistic infant for the Shanghai Expo 2010. In response to the expo’s theme, “Better City, Better Life”, Coixet says she hopes to remind the world that “all our actions have direct consequences on our children’s future and that we have to react to this”. Amen, sister. This entry was posted in Art and tagged Art, Baby, Bastille, China, giant, Isabel Coixet, Miguelín, Paris je'taime, Robot, Shanghai Expo 2010. Bookmark the permalink. It’s neat and all but, admittedly, this really creeps me out. They should use this in a horror movie, for sure.